Replacement Engines UK are one of the UK's biggest suppliers of reconditioned engines. 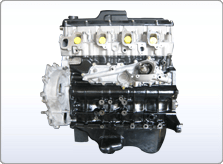 At Replacement Engines UK we have a significant amount of remanufactured engines ready to fit in your vehicles. Whether you're searching for UK, European, German or Japanese rebuilt engines we have all of these in our inventory which is constantly updated. We can offer you the deliveries of recon engines anywhere within the UK or worldwide as required. The Replacement engines UK have developed a very good reputation in the replacement engine industry by offering top quality reconditioned units for the cheapest prices. We have our own factory where engines are entirely rebuilt to the genuine specifications and come with a standard warranty. If your vehicle's engine is very old and needs a replacement then you can contact us for a replacement engine. We can offer you a superior quality low mileage engine with the top notch performance and reliability aside from only tag of reliable Reconditioned engine, If you already have an engine that you would like reconditioned, you can contact us for an early estimation and delivery information. We can bring the vehicle or only the engine from your dwelling or garage to our sites and subsequent inspection and remanufacture, dispatch the vehicle or your engine to your place at extremely impressive rates, or you can receive it by hand if you desire.